After bonding with several backpackers during the bumpy bus ride from Bangkok to Siem Reap, Cambodia, we set about exploring the various temples together. 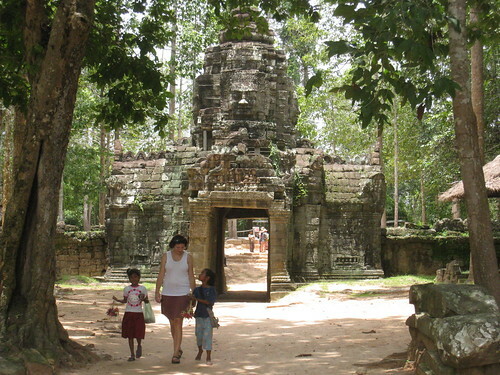 The top 3 are Angkor Wat, Bayon, and Ta Prohm. Then, if you've still got the energy, you can bicycle or tuk-tuk around to the smaller, lesser visited sites. But, it doesn't take a person long to get temple'd out though. Siem Reap was also my first taste of delicious Cambodian cuisine. As it's the tourist hot spot, there are plenty of foodie options, from local markets to nicer restaurants, and surely more upscale ones in the 5-star hotels that are a little further outside the city center.